PHILADELPHIA — The Coast Guard will intensify efforts this winter to stop offshore poaching of Atlantic striped bass along the New Jersey and Delaware coasts. In an effort to ensure the health of the striped bass population, the Coast Guard is working to raise awareness of federal regulations stating Atlantic striped bass may not be caught, harvested or possessed in the Exclusive Economic Zone. The EEZ begins three nautical miles from shore and extends out to 200 nautical miles. While striped bass are typically found closer to shore, changing sea temperatures can cause them to migrate farther than three miles offshore. 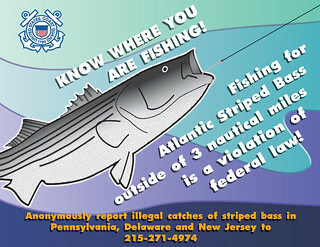 A person caught fishing for, or in possession of striped bass while in the EEZ is subject to civil fines. The public is encouraged to report any suspected poaching activity to Coast Guard Sector Delaware Bay at 215-271-4974. Calls should include a description of the activity, those involved, the location and the time of the suspected offense. Such information greatly increases the effectiveness of law enforcement operations.